Seen with a group of Black-Headed Gulls outside the RSPB Balranald Visitors centre. 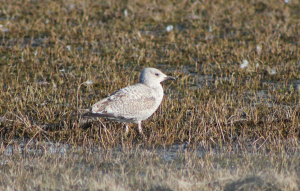 Not sure what species of gull it is. A Kumlins Gull was sighted about 5 Miles away on the same day and Glaucous and Iceland gulls are occasionally sighted or it could be a Herring Gull but it was a bit strange that it was with the Black-Headed Gulls and not the Herring Gulls.